There have been two times I have screamed and cried uncontrollably in a car. Both times were this past summer; just a month apart from each other. The first was when I answered the phone and was told the news that my beloved cousin had suddenly died. The second was when I heard on the radio that my country was taking children away from their parents and holding the asylum-seeking families in separate “detention centers.” In each instance the visceral response was the same—my body took in and understood what I was hearing before my mind could wrap itself around the facts. One epicenter of grief was located with my family member; the other was rooted with people I had never met; but the humanity of each demanded the same instantaneous reaction—a primal scream and wracking sobs. When I received the unexpected news about my cousin’s death, my husband and I were on an interstate traveling to our daughter’s house. When I heard the unfathomable news of the children and their families, I was on a different interstate returning from another daughter’s house. In the first instance, my husband was driving and the eruption of my grief and shock posed no threat to myself or others. The second time however, I was driving alone in the car; and instinctively knew that I needed to find the first exit and stop the car so that I would not endanger anyone as the waves of horror, shock, and grief engulfed my body. Once the car was stopped, and I was able to move around, I began to process the news and ask myself what I would do about this problem. I sent love to the families who were suffering so much. I called my elected officials to tell them my views on the “detention centers,” as well as the facts related to child development and the long-term, catastophic harm this action had immediately caused to the children. I called some family and friends. I called a charity who I had seen on my phone were trying to serve the affected families and left a message volunteering my time. I called and donated money to an organization who had already pledged to fight the new policy of family separation, and who were committed to returning the children to their parents. When I had done all I could think to do, centered, and viewed myself as safe to drive, I returned to the interstate. For the several hundred miles I drove home, the question I kept asking myself was, “What would be my response to this new abhorrent reality?” When I arrived home, I cried in my husband’s arms for those whose pain was beyond my comprehension. We held each other—even as others who shared a love and family connection were denied the same right by my government. I told him that during the long drive home, I had thought of one thing I could do; while at the same time, knowing that nothing I could do would ever be enough for the families who had been forcibly separated. 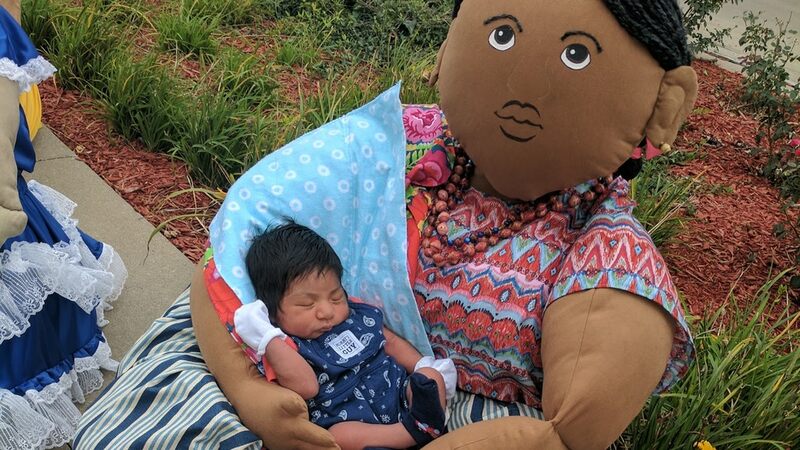 If you would like to help, there is a Kickstarter here – https://www.kickstarter.com/projects/grandmothers/grandmother-healing-dolls-compassionate-creative-a?ref=user_menu Thank you! When, how, and under what circumstances did your family come to this country? The author describes very strong, heartfelt reactions to two situations – one was with family, one was with “the other”. Were you surprised her reactions were identical? Why or why not? Kelly Guinan has a master's degree in transpersonal psychology. She is the author of the revolutionary peace education books, Celebrating Peace, Peace Quest, and Go With Peace. She is the founder of many peace and social justice initiatives including: Young Peacemakers Club, the PeaceMobile, Children's Peace Festivals, the Kindness Campaign, and Grandmother Healing Dolls. She is a social entrepreneur who has empowered many with her creativity, passion, and wisdom.